BDG Publisher Melanie Perillo is always on the move—whether in showrooms, workrooms, construction sites, quarries, shops or private homes. This first installment of a regular video series takes her to 7 Tide in the Boston Seaport, an under-one-roof “design adventure” that should be on the radar of every home design lover and pro in the area. There, she meets up with Sean Clarke, general manager of Clarke, which owns 7 Tide. 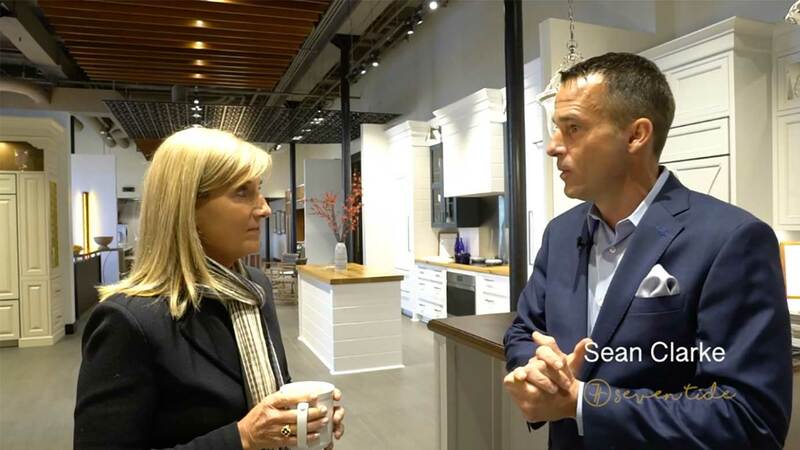 Sean walks her through the custom kitchen cabinetry and bath designs, high-end appliances and the award-winning, hands-on design area at Marvin Windows and Doors. Together, they tour the experience shower at Supply New England (decked out in WOON-TECH gridded glass), nosh on a petite breakfast sandwich (made in the test kitchen with Wolf appliances), and check out a ceiling-high bath-filler that streams a cascade of water into a gleaming Kohler tub alongside Jeff Soderbergh’s ballast stone sculpture.